Kadri Veseli is speaker of the Kosovo parliament and president of the Democratic Party of Kosovo. Leaders of the Western Balkans Six, a group of Balkan countries which are vying for EU membership, will meet this July in Trieste Summit. This is the fourth high-level gathering organised under the umbrella of the so-called Berlin Process. This regional cooperation framework was launched by Chancellor Merkel in 2014, to ensure both increasing cooperation between Albania, Bosnia, Kosovo, Montenegro, Macedonia and Serbia – as well as continuous EU dedication to the prospective new members. The summits have produced some credible results so far. A number of regional treaties have been discussed and may be approved, including on energy, transport, etc. A youth foundation has been established to ensure increased connectivity between the youth of the region, who travel very little to each other’s countries, though they live in the same neighbourhood. As we approach half a decade of the process and four summits attended by heads of states of Balkan countries, as well as Germany, France, Austria and Italy – the time has come to take stock of the progress reached so far in our own countries as well as in the context of wider regional developments. I can speak on behalf of Kosovo and the results of this regional effort are not as visible as they should have been by now. Fault lies primarily with politicians in our own countries. Regional cooperation cannot bypass increasing nationalism or populism. In Kosovo, far too much time has been spent on issues such as border delineation with Montenegro or the Association of the Serbian municipalities – processes that are firmly entrenched in our constitution and the international agreements, but which have been opposed sometimes violently by the opposition and a section of the governing coalition. Lack of progress in these issues delayed visa liberalisation for Kosovar citizens. We’ve experienced economic growth but it has not translated into massive job creation, especially for young people. The Berlin Process was meant to ensure some quick-impact regional transport projects but these projects are still far from being launched. There are very few shovels on the Balkan ground (if any) bearing the brand of the “WB6 cooperation”. I fear the quick-impact has become a long slough. Young people in my country, but also across the rest of the Balkans are exactly the same as young people across Europe – increasingly frustrated with the inequalities and lack of opportunities, eager to speed up the social mobility and looking for jobs which match their qualifications. Kosovo, compared to the rest of the region, has experienced the fastest economic, political and societal progress of the 21st century. In 1999, Kosovo was utterly devastated by war and genocide but even back at 1990, it was the poorest part of the former Yugoslavia, suffering from a century of neglect and apartheid. Kosovo Albanians were only allowed to have their own university in 1974 and the very same university was closed by Milošević in 1990. So the legacy problems of Kosovo were the most challenging ones on the European continent – which makes Kosovo a unique success story. This success is not enough anymore for a new generation of born after the 1999 war ended. Delivering peace instead of war is not enough when kids want good schools and parents want jobs. So Kosovo needs a new beginning, a restart of sorts – and so does the Berlin Process. It was once thought possible by stakeholders in Brussels that regional cooperation and moving towards the EU perspective will enable Balkan countries to gloss over the bilateral problems. Similarly, politicians in the Balkans believed that progress in EU integration could compensate for the lack of dedication to democratic processes and structural reforms (especially in education and democratic institution-building). However, a lack of results in internal reforms and solving the remaining bilateral problems cannot be ignored. It’s foolish to expect that the Balkans can have a unified market when Serb politicians in Bosnia block their own country to have a visa-free regime with Kosovo. It’s even more foolish to expect that lack of recognition of Kosovo by Serbia can be ignored or can be substituted with some sort of unified customs zone. A Kosovar cannot even travel to Budapest by air without paying €100 extra for the ticket because Serbia doesn’t allow overflights from Kosovo. 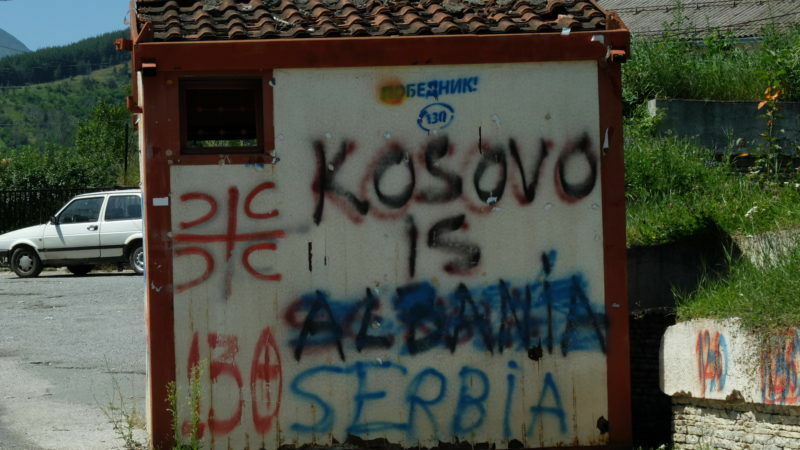 When the Serbian government decides to illegally send a Russian train branded “Kosovo is Serbia” to the territory of Kosovo, the trust is completely eroded. It’s also becoming increasingly obvious that parallel to the dialogue between neighbours in Brussels and the push for more regional initiatives, a new momentum has to be enforced to commit to internal structural reforms which should bring growth and jobs. The EU has the leverage and the US has the authority to jointly push for this renewed vigour. This being said, reforms have to be recognised and the Balkan countries which succeed in delivering a balance of democratic behaviour and economic development should be able to see the light at the end of the tunnel when it comes to the EU membership. A new beginning is a necessity but the promise – and delivery – of EU membership is the sine qua non of stability and progress in Balkans. The gangster statelet of Kosovo needs to be dismantled and the Serbs should sort it out.